Published on Thursday, December 15, 2016. This article appears in the December/January 2017 issue of American Craft Magazine. With her Angora bunnies Igloo and Coquine, Kathy Ruttenberg relaxes in her bedroom sanctuary after a busy day in the studio. She made the ceramic sconce and designed the wallpaper, a commentary on the fate of animals in an age of climate change. 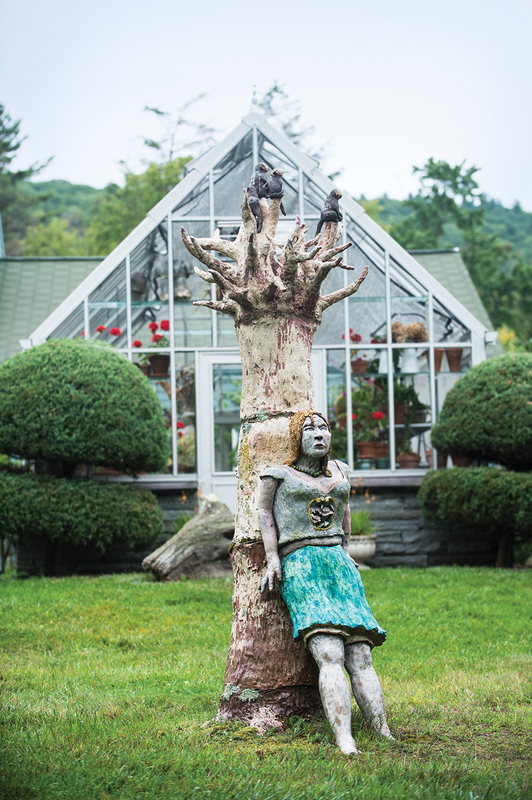 Driving up the winding road to Kathy Ruttenberg’s secluded mountaintop retreat in New York’s Ulster County, you think you might be seeing things. Maybe it’s the morning fog, still settled on the top of the mountain, or maybe your eyes are playing tricks on you – but it looks like there’s a woman, wearing only a bra and colorful stockings, sitting next to a man with a bird on his head in a forest clearing. A little farther on, a larger-than-life plump raven guards a metallic tree. And is that a pair of pants sprouting flowers by the goat pen? You’re not dreaming. 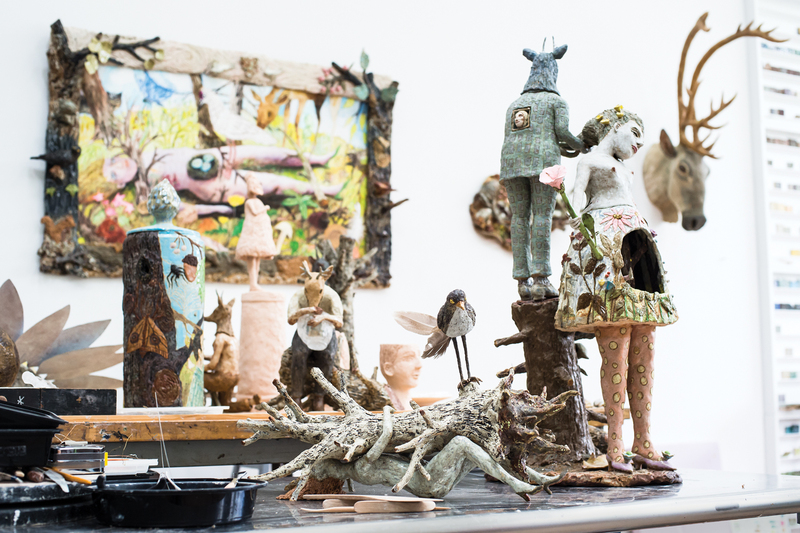 You’ve arrived at the home of an artist who surrounds herself with products of her anthropomorphic imagination, whether it’s sculpture, light fixtures, wallpaper, rugs, or paintings. The real and the fantastic mingle here: Next to an actual Angora rabbit sits a sculpture of a rabbit; a watercolor portrait of a pig adorns the wall of a pig’s bedroom (yes, a pig’s bedroom). On the grounds of Ruttenberg’s home are more than 50 rescued animals, from dogs and cats to turkeys and horses. 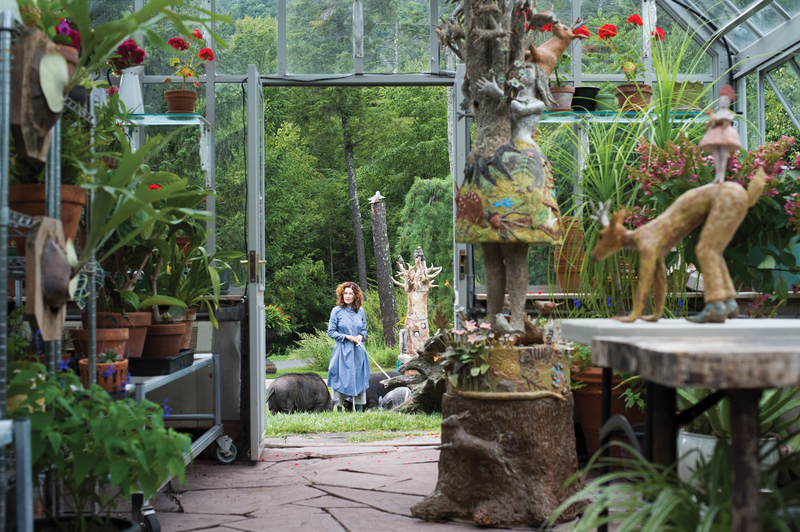 It’s a private zoo that functions as a source of artistic inspiration, as well as an animal haven. Her sculptures explore the human-animal boundary, possessing the stately elegance of Proust, as well as the winsome immediacy of an indie-pop song – simultaneously solid and slight, rooted down and taking flight. They could be set pieces for a Wes Anderson film about a family of eccentric artists creating their own visual language using animal intermediaries. Ruttenberg can usually be found in her studio. There are partially finished sculptures on every surface. Ceramic tree stumps of various sizes crowd the room. A female figure with polka dot legs and stars on her face and torso holds a dead bird; in her see-through stomach, a whole other scene is depicted in colorful glazes. A daisy with metallic petals has sprouted a face with a surprised expression. A stag in a striped suit sits on a log holding a luminous bowl. The more your eyes wander, the more you marvel at the world of exquisite complexity taking shape. You seem to be bursting out all over – with ideas, with physical output. Your studio is a construction zone. Yes, the studio is pretty insane right now. Does it look insane to you? I kept getting new ideas and starting major projects until the studio was brimming with bisque ware. I had to start finishing pieces, so an intensive period of glazing has followed. I am feeling really excited to get all this work resolved – so I can start some new work. Emptying my head of ideas by actualizing them helps me keep a balance in life. There’s a lot of work in progress here. How do you know which piece to work on? I walk through the door and look around, and I become immediately sucked in, without any chance of resistance. I have so many fun projects going at any single moment. If there is any confusion with how to begin, all I need to do is to start to organize and, after about 10 minutes, the creative juices flow. This is such a clarifying moment and a sensation that brings me to that space every single day that I am here. Life in a perfect world means that my studio is always jam-packed with new ideas. I see there’s a couple of peacock feathers incorporated into one of your pieces. I do have peacocks; they offer me beautiful feathers. They’re my family. They keep me humble, help me understand so much, give meaning to my daily routine. The animals are a big focus for me; they make me feel like I have a life. I have seven. I still have my first goat, Vladimir, who is 14 and still has fire coming from his nose. He is so full of life and such an adorable character. The grounds of your property have a quality similar to your work – wild, and, at the same time, technically flawless. Wow, thank you for the beautiful comment. The property is an evolution not dissimilar to my work. Technical flaws are great teachers; there’s nothing like a failure to learn from. The wall behind your bed is covered in wallpaper of your own design, depicting a bustling forest scene that incorporates many of the critters found in the woods around your home. This wallpaper is a reflection of my concern for the wildlife of the world. Because of globalization and global warming, animals will have to adapt to the changing environment or each of their species will fail. The wallpaper not only has local species but every species I like from all parts of the world. The drawing I did for the wallpaper design is called Adaptations. So there’s Trixie the house pig. How many pigs do you have? I have four pigs. Trixie lives in the house, and the other three live in the front of my studio. They are really fun, and I love how much personality they each have. But they do need a lot of attention. What’s it like living with all these animals? It’s a fascinating aspect of my life at this point. I really enjoy how each species has an intelligence that reflects a species specific instinct, and each animal or bird has a unique personality. It takes me outside of myself to see another perspective. I think being so close to these animals has influenced my work and thus the anthropomorphic vision. There is a mental communication that is quite profound. You make all this stuff that you’re surrounded by every day – sculptures, rugs, chandeliers, wallpaper . . . I love to see my vision translated into many media. It’s interesting how the language of each thing translates differently. Besides making me feel dynamic, it is fun to live in my world. I wish I could have more of it, but things on the floor and furniture get destroyed. [Points to a battered armchair.] That was a really pretty chair, and now the rabbits jump on it. So the idea to reupholster it with fabric of my design has been shelved for the time being. Do you ever feel the need to escape your house, filled as it is with your own work? Sometimes I feel anxious to get out of town to change my vision. But this is not because my art is everywhere; it is more that the break in routine is necessary to be able to see what you are doing with a fresh eye. My life here is so much more than the house. I spend an enormous amount of time in my studio and outside. You spend most of your time here in the studio? Yes, I spend the majority of my time here in the studio. I do my watercolors in the house in the evenings, though. Yeah, but right now I can’t even imagine it. But I do. I love it when I have people over. I am just so involved in my work right now. It keeps getting more and more intense. But hopefully soon I will feel like I’ve accomplished something. Because I am so close to my mother [Janet Ruttenberg, also an artist], I feel like I’ve adopted her determination – she’s 85 – to work like crazy. She feels like she has to leave a legacy. I feel that, too. I feel like time is running out. Is there ever a time where you are not creating something? A friend told me, “You need to get creatively blocked so you can have a vacation.” I feel, though, a good vacation is where I come home with a notebook of watercolors and a head full of visions. What’s your favorite spot on your property? I am in so many places in my day; it’s hard to choose. The forest is my idea maker – I walk in the woods every day and end my walk running right to my notebook to sketch or make notes. My studio is magnificent and is pure, pure magic, with north light! The minute it was built I started this era of intense creativity, and that has been going strong for more than 20 years. My bedroom is a sanctuary of sleep and leporine dreams. Two bedroom bunnies, as I refer to them, are my charmed roommates. Brian K. Mahoney is the editor of Chronogram, a lifestyle magazine covering the Hudson Valley. 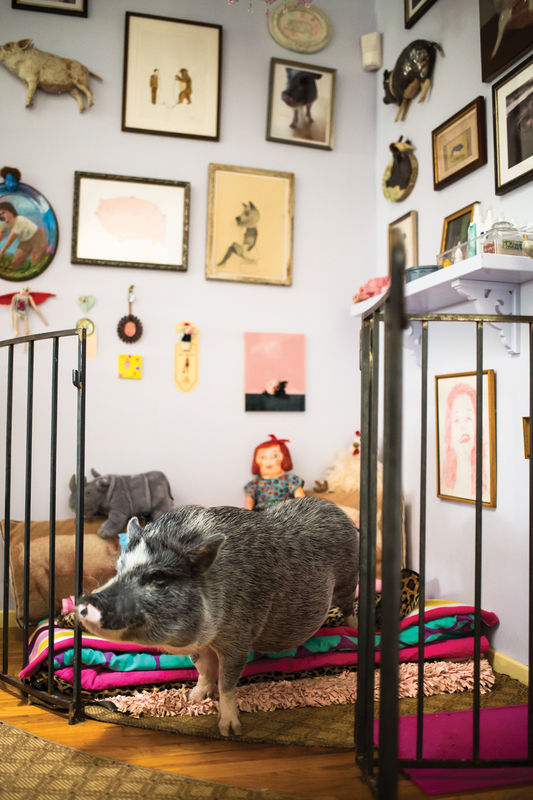 Trixie, Ruttenberg’s beloved “house pig,” has her own bedroom. Her cushy life makes the “outdoor pigs” jealous, Ruttenberg says, and they are often quite vocal about it. 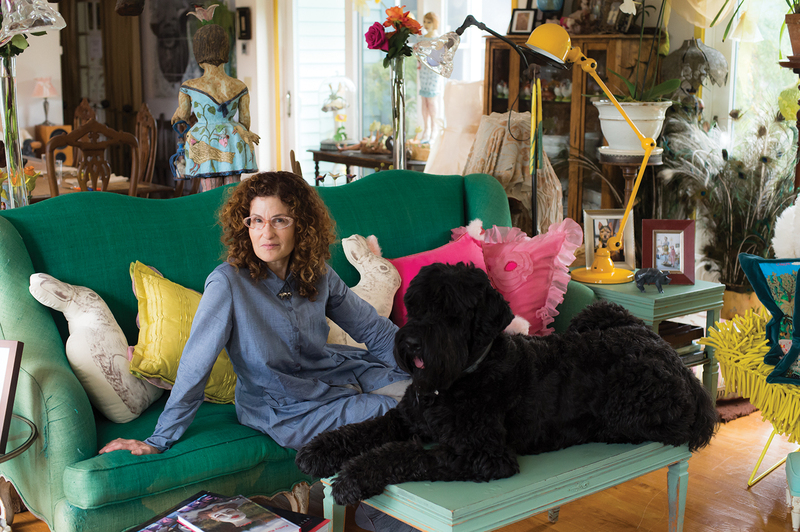 The artist and Roulette, her black Russian terrier, relax in the living room. She’d love to cover more furniture with fabric she’s designed, but the animals don’t always respect the furnishings. Sketches for a ceramic plate. 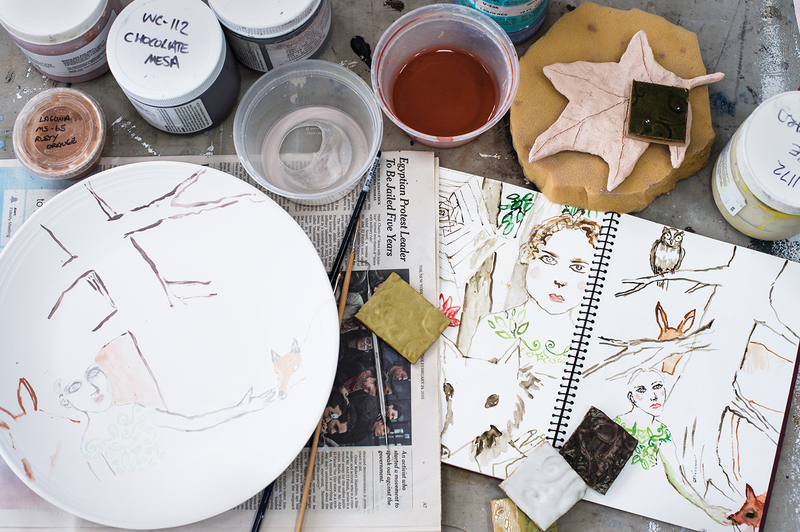 Although Ruttenberg’s primary medium is ceramics, she loves to translate her vision into other mediums. Noodles is one of seven goats who live on the property. Their accommodations include the ceramic planter at the entry to their shed. 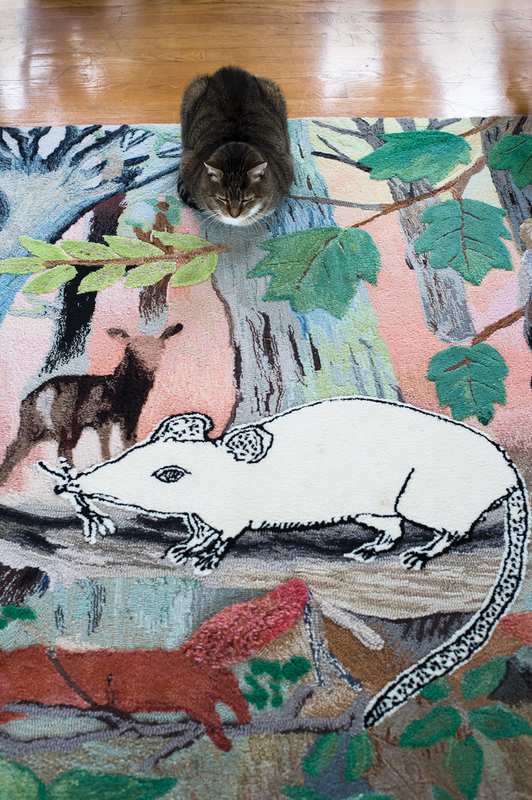 Arnot the cat rests on a Ruttenberg rug, inches from a large rat. On a wall in Ruttenberg’s studio, a ceramic frame surrounds Study For Fertile Ground (2016), while works in progress sit beside the reclining sculpture Me and a Tree (2015). The artist’s anthropomorphic works are inspired by nature and her passion – and respect – for animals. Like her mother, painter Janet Ruttenberg, the artist feels compelled to “work like crazy,” to build a legacy. 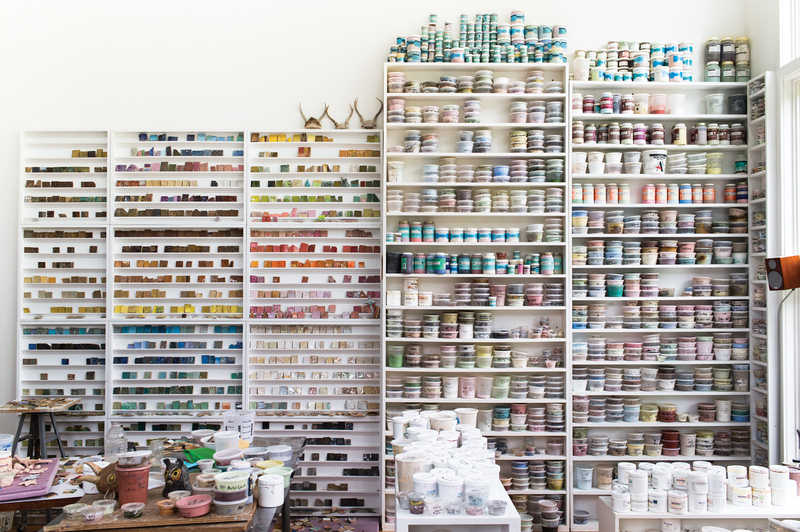 She spends long days in her studio, which has a wall of shelves filled with glazes and test tiles. 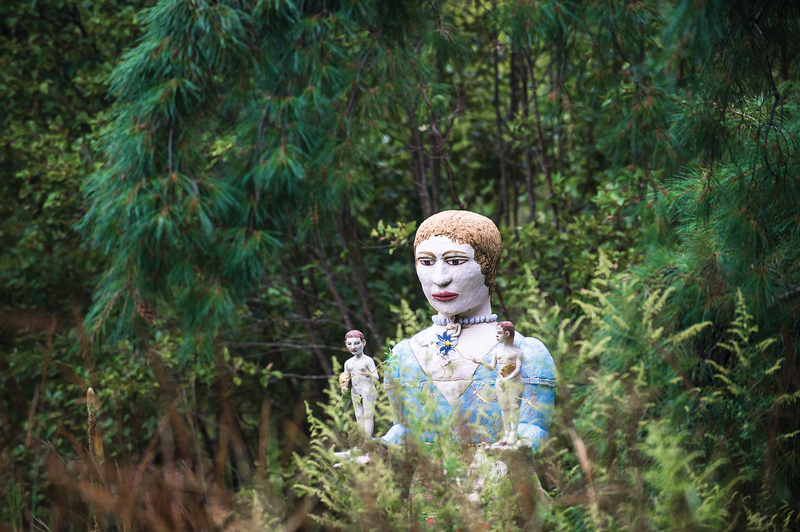 X-Large Lady (2007), almost 9 feet tall, stands guard along a road circling the back lawn. Ruttenberg lingers outside with pet pigs Oola, Boris, Trixie Belle Diamond, and Sir Francis Bacon. In the greenhouse, plants keep company with Origin of Man (2015, right, on table) and It All Flew Over My Head (2014). 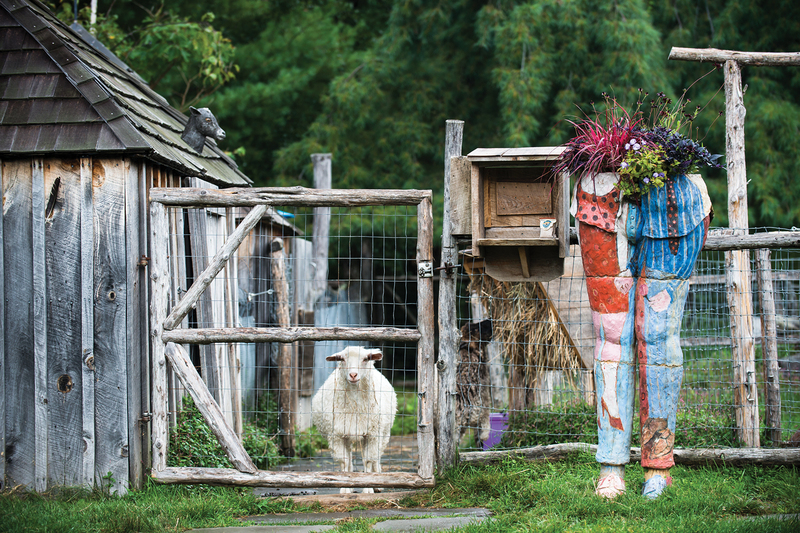 On Ruttenberg’s estate, art and animals mingle. 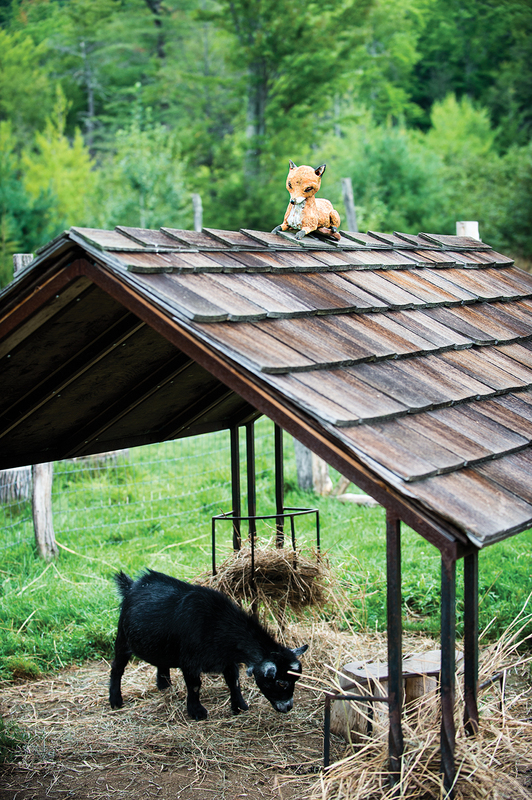 A ceramic fox watches over Emma, an African pygmy goat. In Ruttenberg’s home, predator and prey exist in happy companionship. 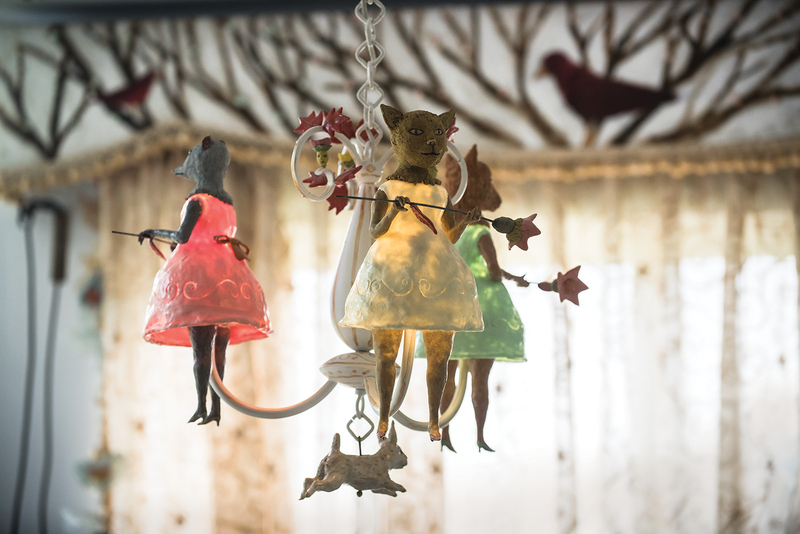 They mingle in her Pursuit chandelier (2009).